Remember Missile Command? The 30-year-old game in which players...command missiles lurches forward towards the silver screen. Earlier this year, there were reports that a movie version of Missile Command, an Atari arcade game in which players try to save cities from raining missiles, was in the works. 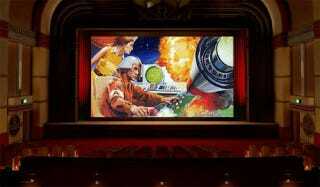 Atari&apos;s Missile Command Bound For The Big Screen? Hollywood is on a 1980s gaming tear of late, developing Battleship and He-Man into feature films. Burk Sharpless and Matt Sazama, who penned the Flash Gordan reboot and co-wrote Dracula Year Zero, will write the movie version of Missile Command. In the original game, plot was thin to say the least, so there's not really much they can screw up, can they? Can they?